It was the kind of spur of the moment decision that only teenagers have the luxury of making. Over homemade cinnamon buns and hot lattes, Janet told me that I would love it--it being the Seminar for United Nations and International Affairs (SUNIA). She had been a camp counsellor there once. It would be a week of intellectual stimulation and flirtations with politically savvy peers. It would be an escape from the monotony of slow nights at the Harbour House and slower days spent with Kenny sucking on popsicles outside the 7-11. It would also undoubtably be a nerd camp. After all, who willingly signs up to attend a political camp in the middle of summer? It would be my last chance to feel popular before I returned to the torment of having food thrown at me daily in the school agora. 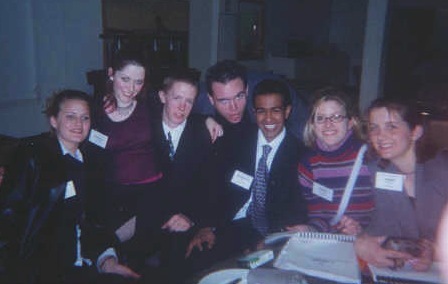 Four months earlier, I had attended the Forum for Young Albertans, a model provincial legislative exercise, where my fellow attendees admired the audacity with which I shredded apart my mandatory pantyhose during lectures. It was one of the best weeks of my life. SUNIA would be no different. It was the summer before my grade 12 year and I had a penchant for Sailor Moon inspired hairdos (pink-tipped hair piled high on my head in two spiky braided buns) and matching outfits (pink tank tops embellished with silver stars and jean mini-skirts). It would be nerd camp and I would be be queen of the nerds. Only five minutes into the bus ride to Nordegg, I realized that I was horribly mistaken. Everyone else had been signed up months in advance and sponsored by their student unions. (My parents paid out of pocket to send me.) They were city kids, who came from schools that had their own model UN and debate clubs. (My school barely offered a French class.) They came from the kind of schools where drama club was something you had to audition for and high marks were a bragging right. They were beautiful, smart and athletic. It took only five minutes to realize that I was the only nerd at nerd camp. By mid-week, I called Kenny and my parents crying. I was exhausted and didn't have any friends, really. Everyone had come in groups from their schools. Every event, activity and meal was an exercise in solitude. There just wasn't room for me in the pre-formed cliques. I didn't have dreadlocks, I wasn't athletic, I wasn't experimenting with my sexual orientation and I didn't belong to a Model UN. I was nothing. I made just one friend that week--on the bus ride home. It was one of the longest weeks of my life. Laying in bed two weeks ago, this was all I could think about. Every time I sign up for something like this, the anxiety returns. It was going to be SUNIA all over again. I was going to be spending a week in the Dominican Republic supervising 275 high school students. What if they somehow knew all this? Teenagers know. They can smell it on you. Relaxing in Punta Cana on a very rare and much-deserved break. As soon as I arrived at the airport, the anxiety intensified. Based on their complete lack of acne, private school education and ability to afford a parent-approved trip to Punta Cana for March Break, I could only assume they were the popular kids. And I had the added uncool disadvantage of being the adult who had to play bad cop to their planned debauchery. I sat down beside a group of boys in the departure lounge, nervously flipping through my staff binder and trying to look busy. Glancing over at the boy beside me, his passport was open to his photo page. And there, in plain font, was the solution to my anxiety. Date of birth: 1993. A decade was sitting between us. This week wasn't the best week or my life or even the longest week of my life. But it was the week I needed to realize that that bus ride was over 12 years ago. This week I also learned that I really do want to continue working with youth in some capacity. I hated the long days, the late nights and the trips to hotel clinic, but I loved all the students. For the first time, I was actually able to see the results of the work we were doing and from that, I got the kind of satisfaction that a steady paycheque has never been able to give me. I'm beginning to realize too, that Year of the Deal isn't so much about saving money. Instead, it's a deal I've made with myself to experience as much as I can this year. The students kept asking me what I do for a living. It wasn't an easy question to answer. I'm a freelance writer, I guess, but I also fact-check, work with international development organizations, clip coupons, join beauty pageants, travel excessively and talk about my feelings way too often. Even though I'm poor, it's the best deal I've ever made.